A motorcycle (also called a motorbicycle, motorbike, bike, or cycle) is a single-track, two-wheeled motor vehicle powered by an engine. Motorcycles vary considerably depending on the task for which they are designed, such as long distance travel, navigating congested urban traffic, cruising, sport and racing, or off-road conditions. Being the most affordable form of motorised transport, in some parts of the world they are also the most widespread (e.g., Vietnam). Laverda is an Italian manufacturer of Combine harvesters and at one time a maker of high performance motorcycles. The agricultural equipment brand is famous for quality, simplicity, and efficiency; while the motorcycles in their day gained notoriety for being robust and innovative. The roots of the BSA 'Gold Star' reach back to the 1930s. In 1937, 'Wal' Handley was the first man to be clocked around Brooklands with an average speed of over 100 miles per hour on a motorbike. Later all riders that could equal this speed were awarded a golden 'Brooklands-Star' pin. Henceforth, BSA changed the name of its 'Empire Star' bike to 'Gold Star'. Our Price: $144.99 Sold Out! MV Agusta is a motorcycle manufacturer founded in 1945 by Count Domenico Agusta near Milan in Cascina Costa, Italy. MV Agusta began as an aircraft manufacturer. They produced their first prototype, ironically called "Vespa," in 1945. After learning of Piaggio's brand new motorscooter of the same name, it was changed to MV 98. It is very seldom that a motor bike brand and a racing driver form such a close relationship as the MV Agusta and Giacomo Agostini. 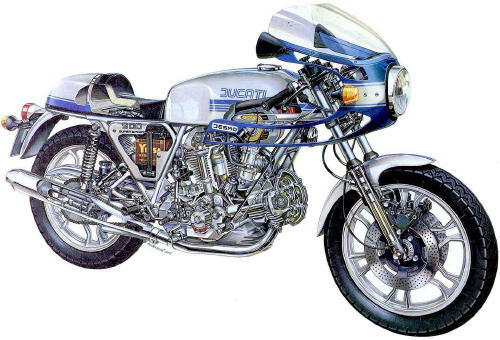 In 1964, as a reaction to the Honda factory bikes which dominated the racing scene in the early 60s, Conte Domenico Agusta ordered the development of a three-cylinder racing bike. Moto Guzzi is an Italian motorcycle manufacturer that was established in 1921 in Mandello del Lario by Lake Como, which is situated at the foot of the Alps in northern Italy. From the 1930s it was the biggest maker, and, up to the '60s, the dominant marque amongst Italian motorcycle manufacturers. The Moto Guzzi 850 T3 'California' was developed for the Los Angeles Police Department on the basis of the 850 T3 model. The advantages of the American comfort-riding style combined with the excellent engine and frame of the T3 made the 'California' an outstanding bike. In 1966, when the prototype of the "Munch" motorbike was presented for the first time to a small audience, motorbike riding was out of fashion. Nevertheless, master mechanic Friedel Munch made his dream come true and built a new motorbike. He had the idea of building a motor bike with a four cylinder engine. The Honda CB750 KO was presented in 1968 and became a sales hit in the USA immediately after its market introduction in 1969. With an engine capacity of 736cm, 67 PS with 8,000 revolutions and a maximum speed of almost 200 km/hour, the machine was a pioneer of its time. The Vincent Black Shadow was a hand-built motorcycle produced by Vincent Motorcycles and introduced in 1948. The series "C" (introduced in the early 1950s) had a 998 cc 50 degree OHV V-twin engine. It ran 7.3:1 compression ratio. The Norton Commando was launched in 1967. In 1969 it was named the "Fastback" due to the shape of its rear fender with the mudguard underneath. The engine had a capacity of 745cc and an output of approximately 65hp @ 6,500 rpm, which enabled it to achieve a maximum speed of 185 km/h. In spite of an internal agreement among the Japanese manufacturers to launch no motor bikes with a cubic capacity over 750 cc, Kawasaki decided to offer the 900 Z1 "Super 4" to the world public in the autumn of 1972. The Great Escape, written by James Clavell and W.R. Burnett and directed by John Sturges is an acclaimed 1963 World War II film, based on a true story about Allied POWs with a record for escaping from POW camps. The Nazis and Gestapo placed them in a new more secure German camp, from which they promptly formed a plan to break out 250 men. The F4 was the motorcycle that launched the resurrection of MV Agusta in 1998. The F4 was created by famous motorcycle designer Massimo Tamburini at CRC (Cagiva Research Center), following his work on the Ducati 916. The idea of the X75 was developed by Don Brown, who was the sales manager of the American importer in Nutley/ New Jersey. When he saw the new 750 Rocket3 in 1967, he was shocked. In his opinion the triple for the US-biker was way too conservative. In spite of an internal agreement among the Japanese manufacturers to launch no motor bikes with a cubic capacity over 750 cc, Kawasaki decided to offer the 900 Z1 "Super 4" to the world public in the autumn of 1972. The Z1 was a powerful four-stroke bike with 82 hp @ 8500rpm. The Yamaha SR500 is a popular thumper. It first started production in 1978, as a road-going version of the popular Yamaha XT500. It experienced good sales throughout the US, Europe and Australia and continues to be manufactured in Japan today as the SR400. The Kawasaki Z750RS Z2 was introduced in 1973 as a smaller displacement "brother model" to their already successful Z1 for the Japanese market. The Scout and Chief V-twins, introduced in the early 1920s, became the Springfield firm's most successful models. Designed by Charles B. Franklin, the middleweight Scout and larger Chief shared a 42 degree V twin engine layout. The BSA Rocket Three/Triumph Trident T150 was the first true modern superbike and the last major motorcycle developed by the original (Triumph Engineering Ltd) Triumph company. It was badge-engineered to be sold under both the Triumph and BSA marques. The Suzuki GT750, which was an upper class motorcycle, was shown for the first time at the 17th Tokyo Motor Show and launched in September 1971 as a sports tourer (GT standing for Grand Tourismo). In spring of 1972 the motor cycle, nick named 'kettle', was also available in Europe. The Triumph Tiger 100 (T100) was a British motorcycle first made by Triumph at their Coventry factory for 1939. With the runaway sales success of the Triumph Speed Twin, Edward Turner's mind turned to further developing the potential of his new parallel twin motor. The Benelli 750 Sei is a motorcycle that was produced by Italian manufacturer Benelli from 1972-1978. It was the first production motorcycle with a 6-cylinder engine. The engine was based on the four-cylinder Honda CB500, but with two extra cylinders.